More information below, click here to jump there now. 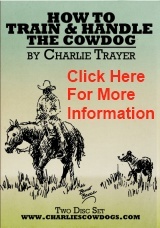 Here is an opportunity to learn from Charlie Trayer. This will be an excellent opportunity to get the correct start on your young dogs as well as fine tune those already started along with learning more about handling livestock. There will be an extra day on Thursday March 28 for any one who has never worked a stockdog before or has a pup to start. This will help the "Beginner and or their pup" get up to speed for the second and third day of the clinic. You will have the opportunity to work your dog with personal instruction several times per day. The investment for the 3-day clinic will be $300 per dog and handler. The cost for the 2-day clinic on March 28-29 is $225 per dog and handler. Each additional dog is $100. To Audit (watch) the fee is $50 per day or $80 for 2 days or $125 for all 3.